Discovering a visual feast for mind, body and soul. I have found a paradise here on earth! 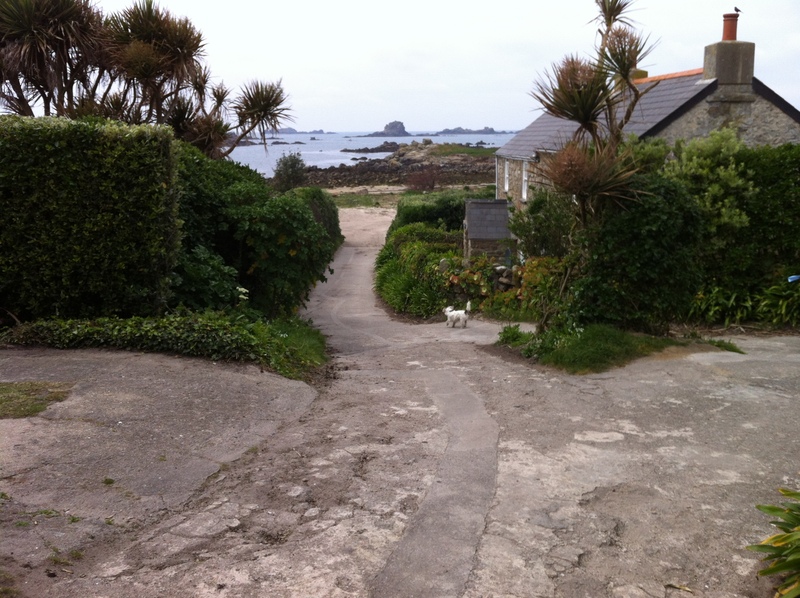 Surprisingly, I have lived in Cornwall for 14 years but this is the first time I have had the opportunity to visit the Isles of Scilly. It’s a first for the dogs too. First time on a big boat for them, let alone the island hoppers. The noise of the engine is a little alarming at first but they soon get used to that. 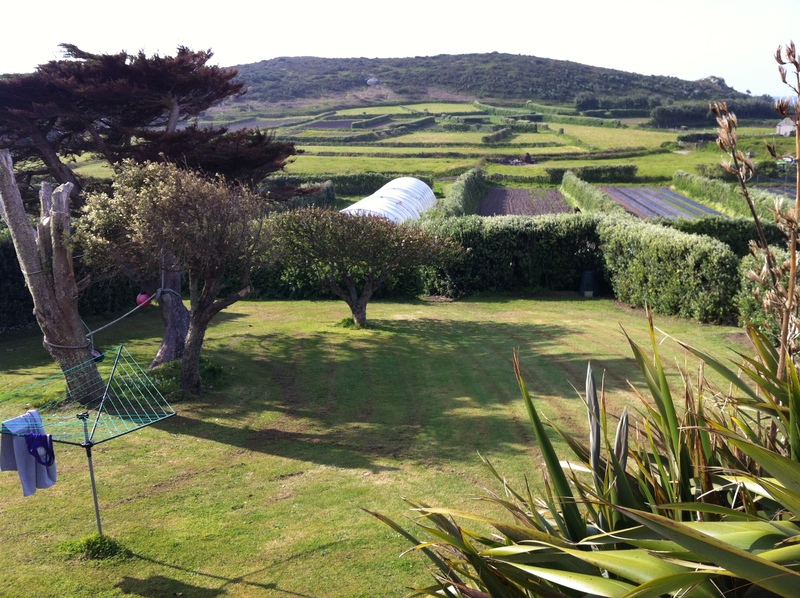 We are staying on the small island of Bryher, based in a cottage at Hillside Farm. My hosts are delightful and they have farmed this land for several generations. I, my bags and dogs are collected from the small jetty, all bundled into the back of an old red Landrover for the short, bumpy ride back to the farm. Aptly named, this small farm overlooks its own fields surrounded by high, pittosporum-hedged windbreaks. 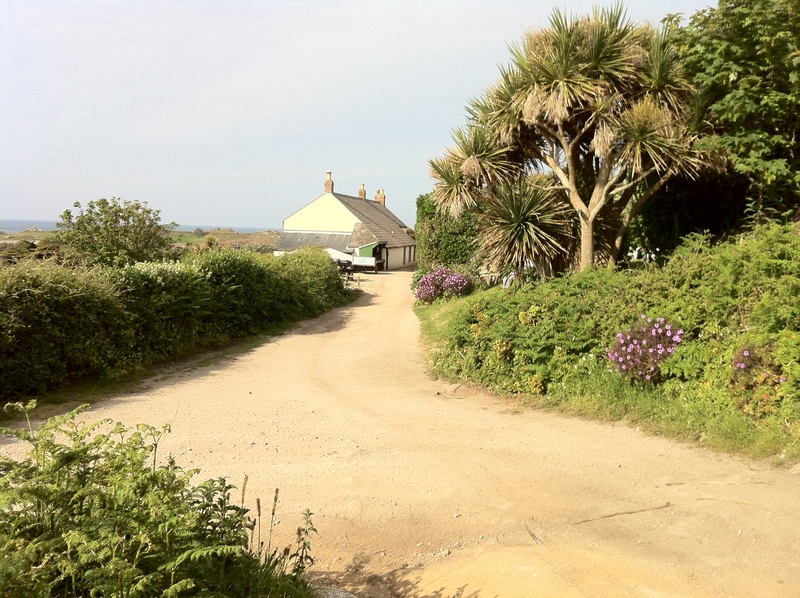 In the past, the fields of Bryher supplied the mainland with early Spring flowers like daffodils and anemones before cheap imports from South Africa put them out of business. Now, the produce from Hillside Farm supplies both islanders and visitors with fresh vegetables and eggs. Birds use this area as a corridor. The whu whu coming from the pair of swans that live on the pool in front of Hell Bay Hotel just around the corner makes me look up from my sketch books as they fly backwards and forwards on their daily comings and goings. A young blackbird comes to my breakfast table every morning, fluttering its wings and asking to be fed. Thrushes. I haven’t seen these songsters for years, and sparrows. The air is just bursting with a multi-toned symphony of sound which is all overlaid with a more raucous stave of tunes from a variety of seabirds: Oystercatchers, Herring Gulls and pretty little Kittiwakes. They are so close, I am forever peering into the shrubbery or tops of boulders to see who is making these wonderful avian sounds. 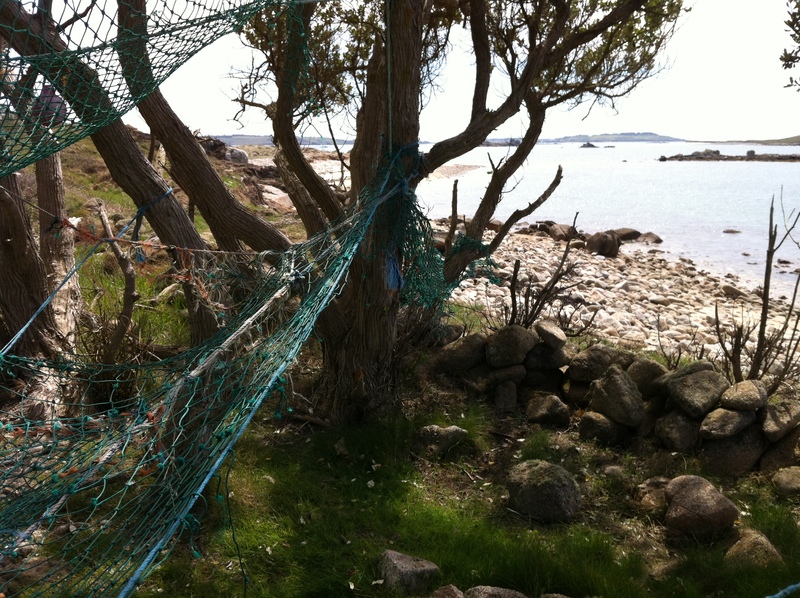 If you are not careful, it is all too easy to stumble on a nest half-hidden in rocks on the foreshore or know I am near one by the screeching alarm calls from anxious parents. 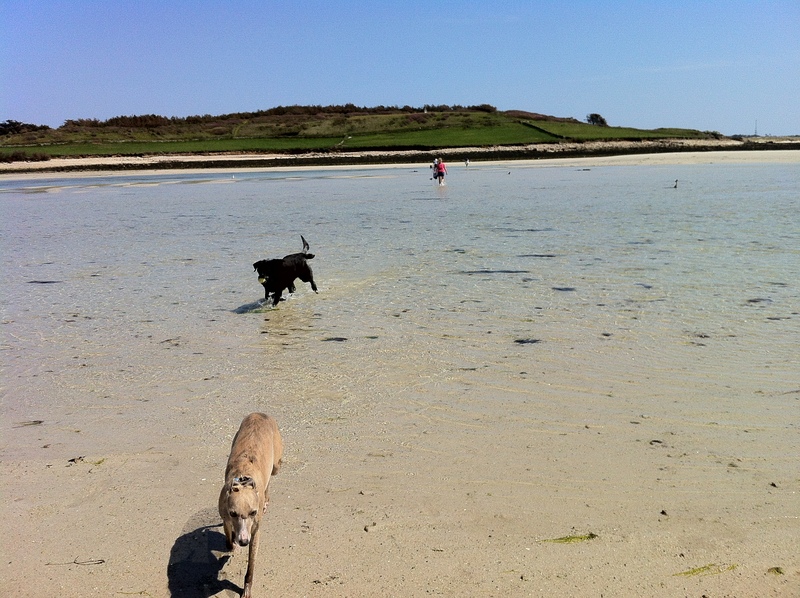 On our first day, we were able to walk across the sand banks to Tresco and back again, thanks to the low Spring tide. Being brought up on the beaches of Cornwall, the dogs are in their element too. Wading, knee-deep in the channels, Tammi wild with excitement, darting across the sand banks and jumping into the water to splosh her way across, whilst Sadie sticks to me like a shadow. I am pretty excited too. It is a hot, crystal-clear, perfect day. I thought life just couldn’t get any better than this. If ever there was a time when I wished I had a camera with a zoom lens or the ability to make panoramas, then this is it. I tried to make some with the ‘pano’ App on my iPhone. They make some strangely distorted images but I like these unusual angles. (Click on them for a better look.) All the photographs in this post are from my iPhone camera and I haven’t ‘doctored’ any of them. 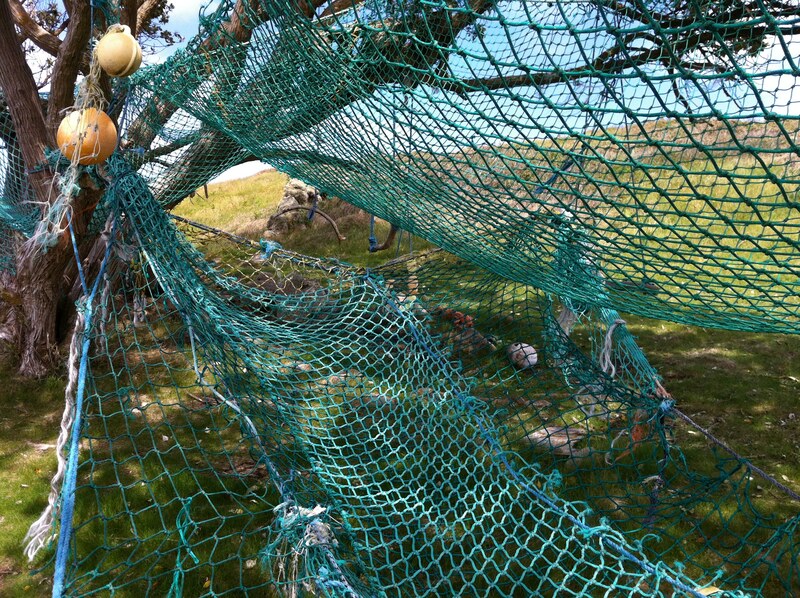 These islands are only a few square miles at most, so everything is on a human scale. Scan the horizon and most of what you see is within a single viewpoint. There is no need to adjust the settings on your camera to ‘toy-town’ scales. It is a ready-made landscape in miniature. 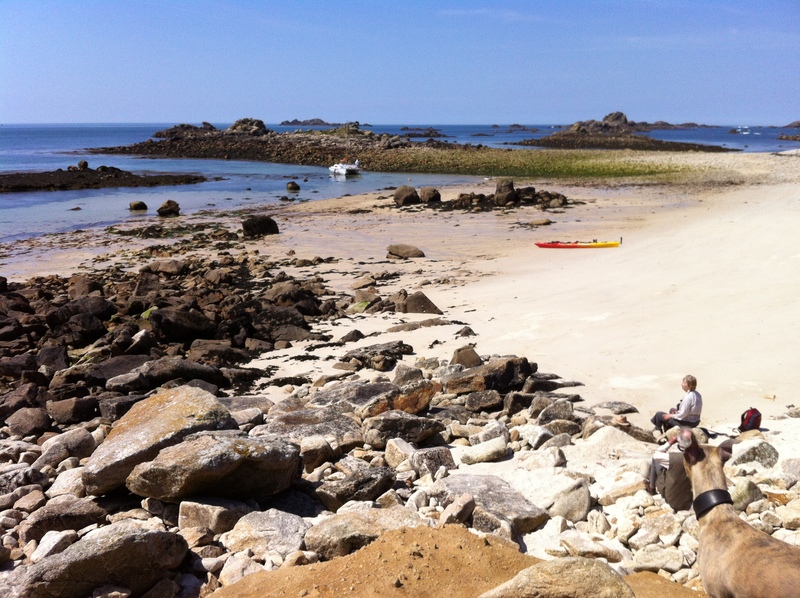 It is Les Ecrehous, Les Minquiers and Jersey, with a dash of Barbadian beach idyll, all rolled into one. I also tried the traditional 4-photograph panoramas. 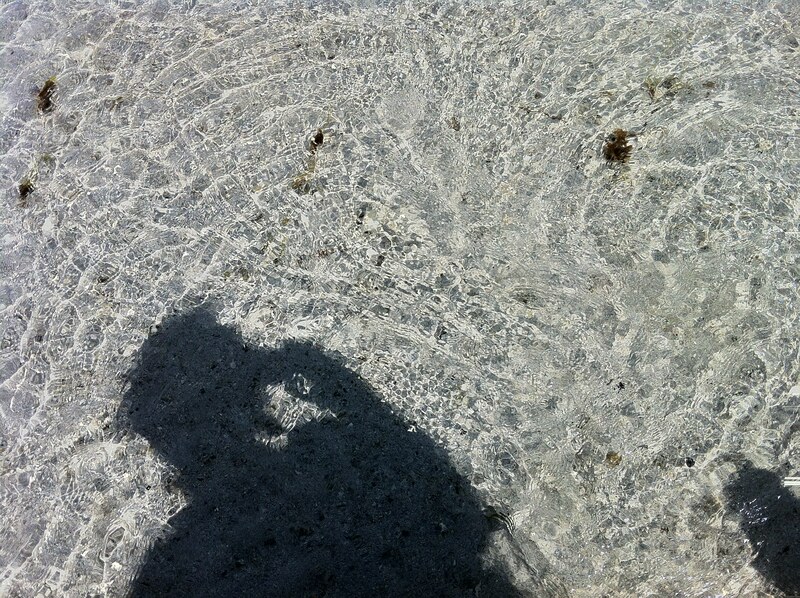 I was surprised just how often I found myself alone on these desert island beaches feeling like a castaway. I could fancifully imagine myself as a Mrs Robinson Crusoe. 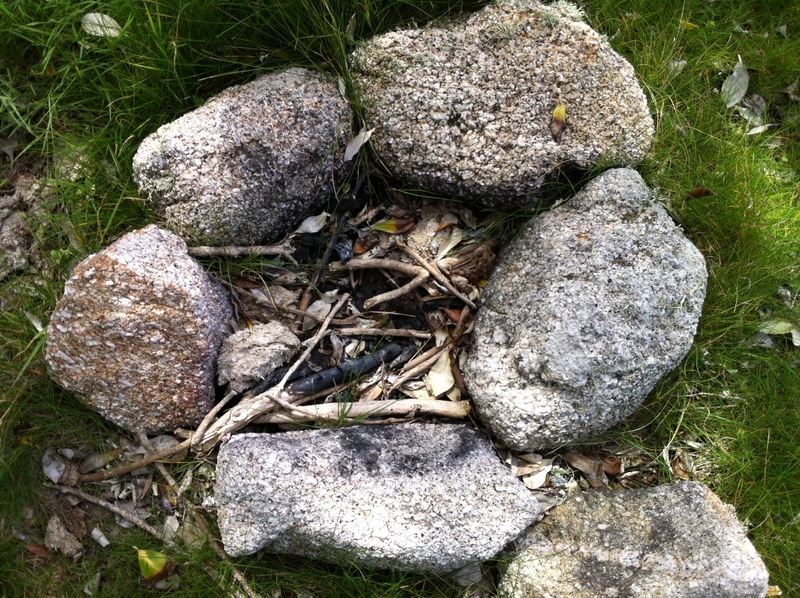 Even found his abandoned camp, complete with fire pit. This is a place that is hard to leave. 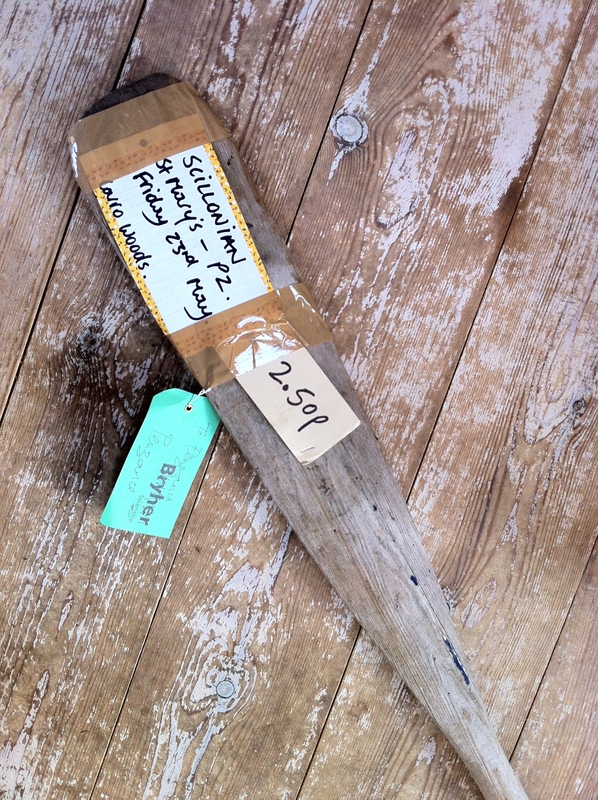 Physically, I have returned with an old gig-racing oar that the farmer turfed out of his barn having deemed it of no use to anyone any more. With little thought about how to get it home together with 2 cases (one for clothes, one for art materials), a rucksack and 2 dogs, it is £2.50 worth of island history that I just had to have as a souvenir. Plus a handful of white sand to view under the microscope. Spiritually, this place has seeped into my being, through the pores of my skin and found its way into my heart. The question is not if, but when can I come back again?